We are still stuck in the house because of the cold, and both Grace and I are bored out of our minds. Normally, I try to plan an activity to get us out of the house everyday, but this week has been brutal. Grace has grow tired of all of her toys and has started to explore her surroundings even more. Due to the open floor plan in our house, I can let Grace explore until her little heart is content and still keep an eye on her. Most days I let her roam wherever she wants and explore anything and everything. Of course, a few of the cabinets are child-proofed, but for the most part she goes wherever she pleases. This has led to some fun and a lot of mess, especially since she loves to empty the contents of every drawer and cabinet within reach. In order to combat some of our boredom and the corresponding messes Grace and I have been busy doing some craft projects this week. 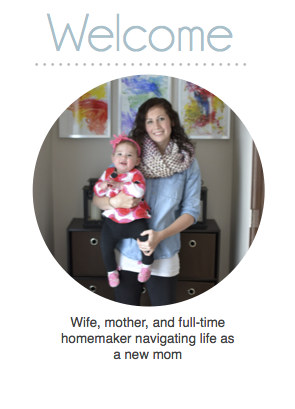 Since she is only 10 months old we could not do anything too elaborate but here are some of the projects we did. 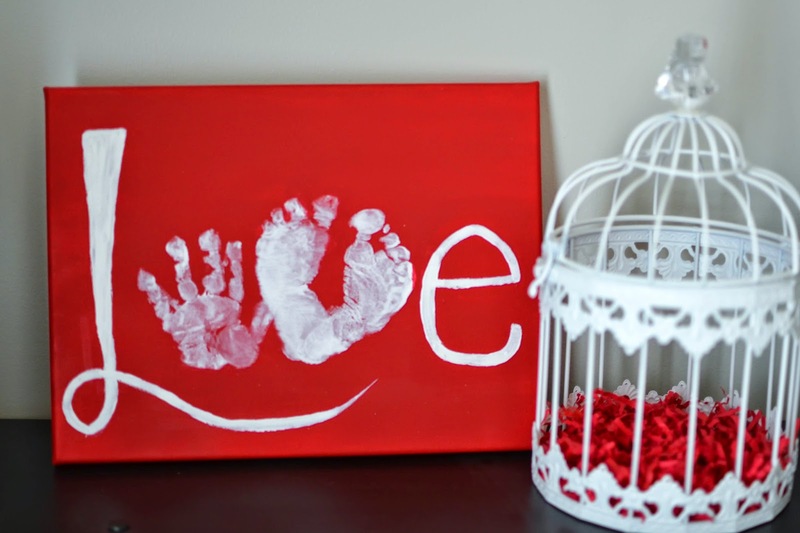 The first project we tackled was this hand and footprint love sign that I found on Pinterest. I bought a 8x10 canvas at Michael's and painted it red with some cheap acrylic paint . Then came the hard part. I needed to get hand and footprints from Grace. Surprisingly she enjoyed making the handprint, but the feet were another story. I ended up doing her feet while she was eating in her highchair. She is the most cooperative child when she has food. This is how I get her nose wiped and her hair in a ponytail in the morning. We have already established that Grace loves to make a mess, so naturally she loves to fingerprint. 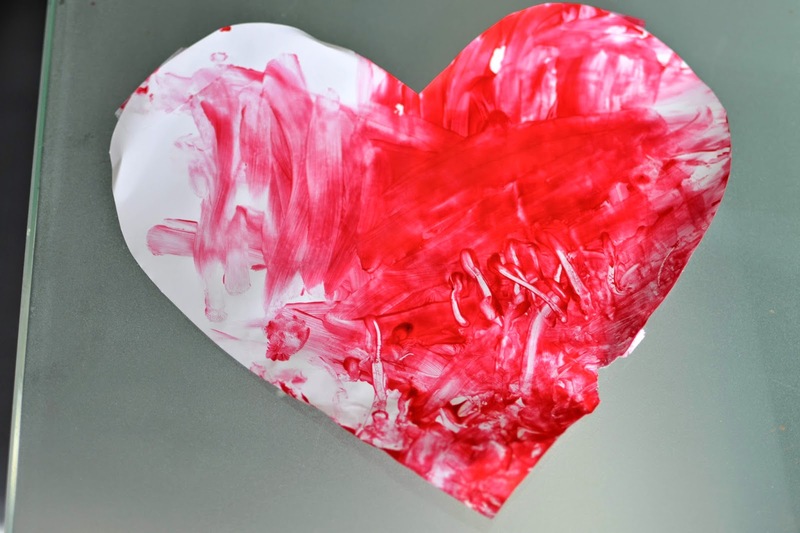 This is the perfect activity for a pre-toddler. 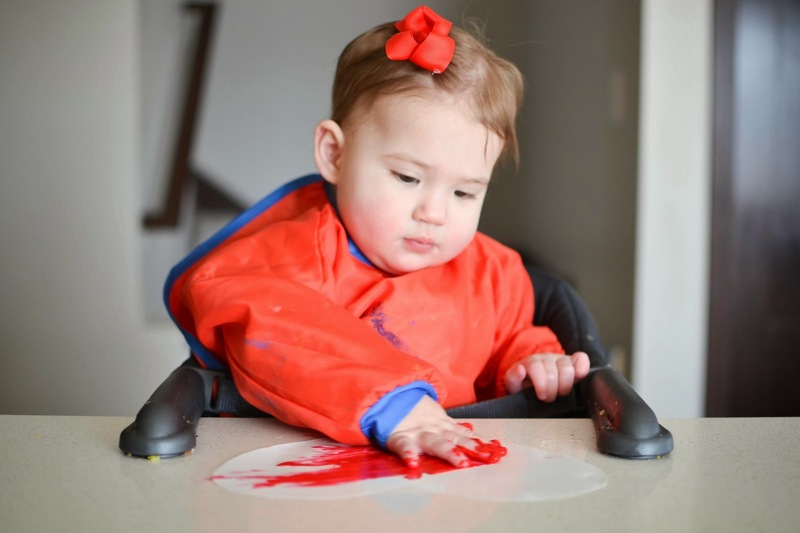 It takes very little fine motor skills and is a simple concept to grasp while fostering hand-eye coordination, creativity, fine motor development, and sensory processes. However, fingerprinting may just be a little too fun. Normally Grace will transition from activity to activity without too much fuss, but if you try to stop her from painting before she is ready, she explodes. This kid could give a two-year old a run for their money in a tantrum throwing contest. Since she never wants to stop painting mommy gets a lot of pretty art. Just for fun I added a bonus picture of Grace. She can walk with her walker all over the house but refuses to walk on her own. I know that she can do it because she has taken some steps by herself when she has gotten really excited. However, as soon as she realizes she is not hanging on to anything anymore she sits back down and crawls to her destination. I guess she is just not ready to give up her safety net yet. That's fine by me. 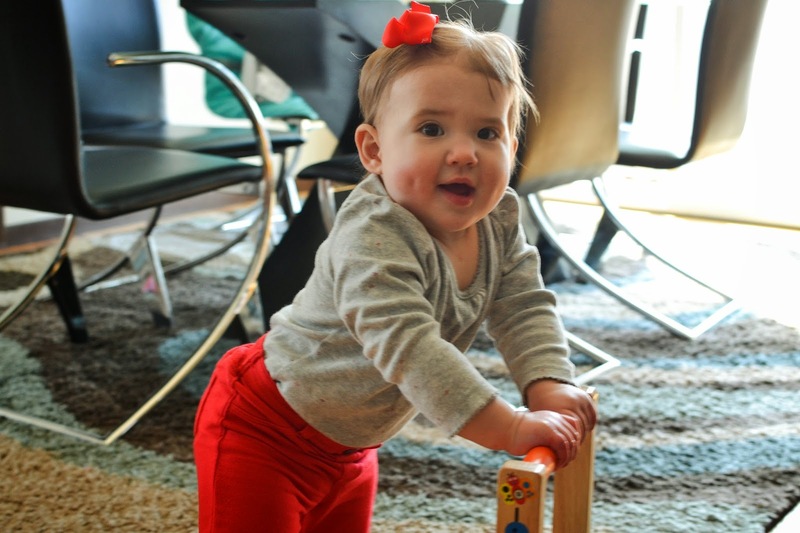 I have enough trouble keeping up with her when she's only crawling.